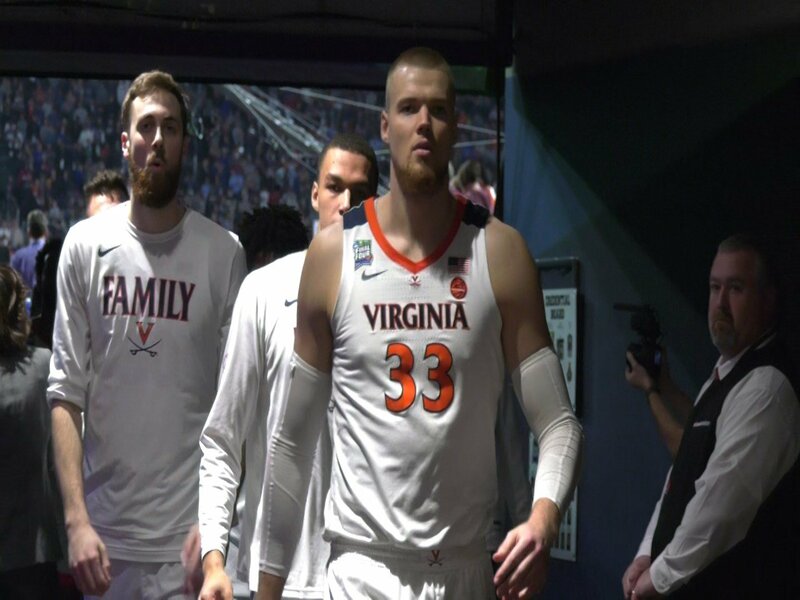 The Virginia basketball team beat Auburn 63-62 in the Final Four in Minneapolis to advance to the NCAA Tournament Championship game for the first time in program history. MINNEAPOLIS, Mn. 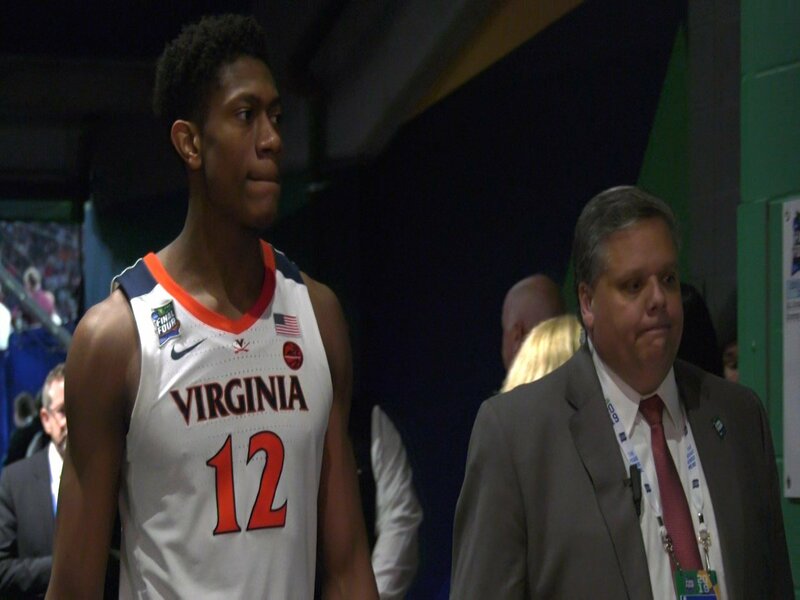 (WVIR) - Kyle Guy hit three free throws with 0.6 seconds left, and the UVa basketball team beat Auburn 63-62 in the Final Four on Saturday in Minneapolis. The Cavaliers advance to the NCAA Tournament championship game for the first time in program history with the win. "These are moments that every basketball player has dreamed of," says Guy. "Hitting the game-winning shot, or free throws, or whatever. You kind of have that feeling in your stomach, like a good nervousness, like, &apos;Alright, this is my chance. To be able to go to the national championship off of that, for these guys, and coach (Tony) Bennett, I really don&apos;t have the words." Virginia led by ten points with five minutes left in the game, but the Tigers chipped away, and UVa trailed by two with 1.5 seconds left. Guy missed a three-point shot in the corner, but he was fouled on the play, and the junior converted all three free throws to give the &apos;Hoos the lead. "I was in my own world," says Guy. "I looked for my fiance, I couldn&apos;t find her, so I looked at my dad, &apos;I got this.&apos; Then I looked at my future brother-in-law, and he just started smiling, and I smirked at him, and was like, &apos;We got this.&apos;"
The three shots from the charity stripe were the only free throws Guy attempted in the game. Junior forward Braxton Key says, "I thought the three was going to go in. I don&apos;t think he&apos;s going to miss a shot, ever. When he got to the line, I knew the game was over. I knew we were going to win." "It&apos;s unbelievable," says junior forward Mamadi Diakite. "It&apos;s amazing, what happened. Kyle being cold-blooded, and taking that shot." Freshman guard Kihei Clark says, "We knew he was going to make it, no matter what. No doubt in our minds." Bennett says, "We played well in the second half, and then they made the plays. I do feel for Auburn, but I feel better for us right now. I&apos;m just thankful that these guys stepped up, and played the way they needed to. We got through. &apos;Survive and Advance.&apos; I guess that&apos;s taking on a new meaning." Not everyone believed Guy was fouled on the game-changing three-point attempt. Auburn senior guard Bryce Brown says, "I didn&apos;t think it was a foul, but the refs thought otherwise. You can&apos;t go back and rewind it." UVa junior guard Ty Jerome says, "They also called some fouls for them down the stretch that could have gone both ways. People can say what they want, we&apos;re going to the National Championship." Virginia (34-3) will play in the NCAA title game for the first time in program history, after being the first No. 1 seed to lose to a 16-seed last season. "This time last year, we were starting our spring workouts," says Jerome. "To still be playing at this point in the season, after tonight, with one other team in the country, on the stage that you dream about as a little kid, it&apos;s an unreal feeling. We&apos;re going to do everything we can to finish the job." Fifth-year senior Jack Salt says, "We&apos;ve experience high&apos;s and low&apos;s. Extreme high&apos;s, and extreme low&apos;s. To come through that, and to be at this point right now, and have an opportunity in the National Championship game on Monday is huge." Guy says, "Just to hear that phrase, say it, let alone experience it, is something that everyone says they want to do, but not very many people get to. You&apos;re not always sure that it is going to happen, so to be able to do that, and to have a chance to do something that this team, and this program has never done, would mean the world to me." "This is exactly why I came back," says redshirt sophomore De&apos;Andre Hunter. "I knew the team we had. We were going to have a great chance to make it to the National Championship. It was a goal we set at the beginning of the year, and we&apos;ve reached it." Jerome scored a game-high 21 points and grabbed nine rebounds for UVa, while Hunter added 14 points and five boards. Virginia held Auburn (30-10) to 38.2 percent shooting in the game (21-of-55), and the Tigers only made 9-of-31 three-point tries. Jerome says, "After the first round, they said, &apos;What&apos;s it like to win this one, after last year?&apos; and then, &apos;What&apos;s it like to go to the Sweet Sixteen after last year?&apos; Every step of the way, I&apos;m thankful. Thankful to spend more time with this group of guys. Thankful to bring joy our fans, and thankful to be with these coaches. It&apos;s an unreal feeling. Unreal feeling." The Cavaliers will face Texas Tech in the finals on Monday, after the 3-seed Red Raiders defeated 2-seed Michigan State 61-51. "There&apos;s been a lot of great teams, great players, and great coaches who have come through here," says Key, "and just for us to finally do it, get over that hump, and do it for the fans, and everyone back in Charlottesville, is huge. I can&apos;t even put it into words, honestly." Virginia and Texas Tech tip-off in the NCAA National Championship game on Monday at 9:20 PM ET.